[185 Pages Report] MDI, TDI, and Polyurethane Market was valued at USD 65.63 Billion in 2015. It is projected to grow at a CAGR of 5.45% from 2016 to 2021. The base year considered for the study is 2015, and the forecast period is from 2016 to 2021. The research methodology used to estimate and project the market size included the top-down and bottom-up approaches. The total size of the MDI, TDI, and polyurethane market was calculated and accordingly, weightages were provided for various segments. This was done based on extensive primary interviews and secondary research based on the information available on websites of various associations such as Federation of European Rigid Polyurethane Foam Association, ISOPA (European Diisocyanate and Polyol Producers Association), and Polyurethane Foam Association. Primary research conducted for this report included extensive interviews with key people such as CEOs, VPs, directors, and executives. After arriving at the overall market size, the total market was split into several segments and subsegments. The data triangulation and market breakdown procedures were employed to complete the overall market engineering process and arrive at the exact statistics for all segments and subsegments. The breakdown of profiles of primary respondents is depicted in the figure below. Micromarkets are defined as the segments and subsegments of the global MDI, TDI, and polyurethane) market included in the report. Core competencies of the companies are captured in terms of their key developments, SWOT analysis, and key strategies to sustain their position in the market. 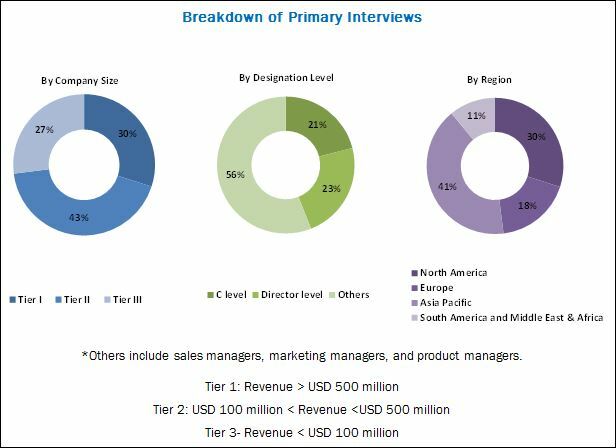 The ecosystem of the MDI, TDI, and polyurethane market comprises manufacturers of isocyanates and polyurethane systems such as BASF SE (Germany), The Dow Chemical Company (U.S.), Covestro AG (Germany), Huntsman Corporation (U.S.), Mitsui Chemicals, Inc. (Japan), E.I. du Pont de Nemours & Company (U.S.), Chemtura Corporation (U.S.), Wanhua Chemicals Group Co., Ltd. (China), Woodbridge Foam Corporation (Canada), and Chematur Engineering AB (Sweden); end-use industries such as automotive, construction, furniture & interiors, electronics & appliances, footwear, packaging, and apparel. 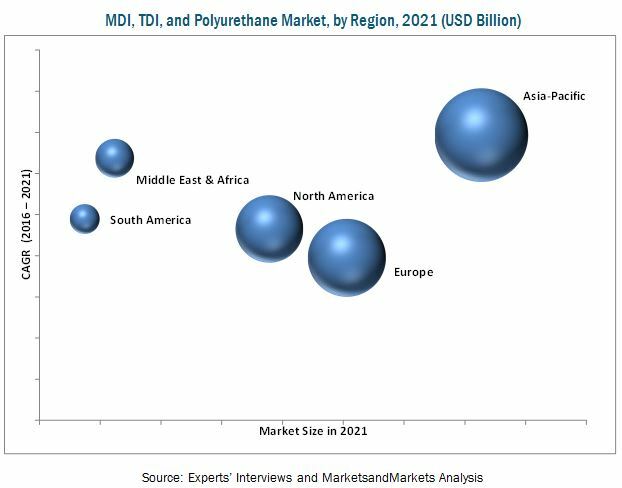 MarketsandMarkets projects that the market for MDI, TDI, and polyurethane will grow from an estimated USD 69.28 Billion in 2016 to USD 90.34 Billion by 2021, at a CAGR of 5.45%. This market is growing because of the increase in demand for polyurethane from various end-use industries such as construction, automotive, and electronics. This growth in the consumer industry is expected to drive the demand for polyurethane as it is predominantly used in refrigerators, freezers, televisions, and other consumer electronics. The MDI, TDI, and polyurethane market is segmented by application, end-use industry, and region. Based on application, the rigid foams segment is projected to grow at the highest rate during the forecast period. Rigid foams find uses across various applications, primarily as insulating foams and structural foams in the construction industry. Based on end-use industry, the market is segmented into construction, furniture & interiors, electronics & appliances, automotive, footwear, and others (apparel, marine, medical, packaging). The footwear segment is projected to grow at the highest CAGR, between 2016 and 2021. The lightweight, high abrasion resistance, and excellent long-term mechanical properties of polyurethane make it preferable for hardwearing shoe soles. Based on region, the market for MDI, TDI, and polyurethane is segmented into North America, Europe, Asia-Pacific, South America, and Middle East & Africa. The Asia-Pacific market is projected to grow at the highest rate from 2016 to 2021, as countries in this region are expected to witness high growth in the construction, electronics, and automotive sectors; this would lead to a high demand for MDI, TDI, and polyurethane. There are certain factors that restrain the growth of the MDI, TDI, and polyurethane market. Some of these include the increasing environmental concerns and availability of eco-friendly substitutes such as epoxy-based coatings. However, the polyurethanes industry is continuously striving for sustainability in business practices and is focused on developing renewable feedstocks for polyurethanes as well as finding alternative production methods to exclude the use of highly toxic and hazardous chemicals. Expansions were the major strategies adopted by most players in the market. Companies such as BASF SE (Germany), The Dow Chemical Company (U.S.), Huntsman Corporation (U.S.), Covestro AG (Germany), Chemtura Corp (U.S.), and Mitsui Chemicals, Inc. (Japan) were the key players who adopted these strategies to increase their product offerings, customer bases, and to stay ahead of competitors. Companies aim to invest in research & development activities and introduce new and cost-efficient manufacturing technologies to keep up with the changing consumer needs.